Egg Hunt is a game reminiscent of the PC game Kye from the early 90's. It involves you moving your android around the arena, capturing eggs. In order to do this, you may need to move obstacles out of the way, and avoid being caught by the roaming enemy androids. The initial screen shows some of the different objects you might encounter. 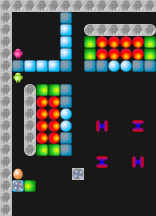 The red balls travel in the direction of the highlight and may roll off curved walls, or other balls, provided there is space to fall through (to the left or right) and into. The ball will not fall into an occupied space unless it is an empty sink . Empty sinks will consume objects which enter them. The green blocks (shown in later screenshots), also travel in the direction of the highlight, but these blocks will not roll off anything. Both red balls and green blocks will change the direction they are travelling in if they bump into a spinner . Spinners rotate either clockwise or anti-clockwise. If a ball or block hits a clockwwise spinner, it will be turned anti-clockwise, e.g. from northwards, to westwards. If a ball or block hits an anti-clockwise spinner, it will be turned clockwise, e.g. from eastwards, to southwards. 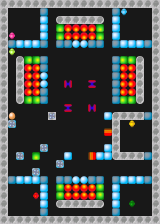 The bright blue blocks can be pushed, provided there is space (or an empty sink) on the other side. However, objects will not move of their own accord if they are being held by a magnet . The faded blue blocks can be removed by moving onto them. There are number of menu options available to ask for a hint, restart the current level, go back to the previous level, skip to the next level (only if you have previously completed the current level), and change the current viewing resolution. The viewing resolutions are large, medium and small for changing the size of the objects in view. If the whole arena (practice level in this case) does not fit onto your screen, it will move as you move your android to keep the android in view. Most, but not necessarily all, levels will fit on the T-Mobile G1 screen in small resolution. For help and advice, why not try the Discussion Forums?